Ensifera is a suborder of the order Orthoptera, comprising "long-horned" orthopterans commonly known as crickets, katydids (or bush crickets), and weta, and characterized in extant members by long, fine, and threadlike antennae that have well over 30 segments and in some species can reach several times the body length. "Ensifer" means "sword bearer" in Latin, and refers to the typically elongated and blade-like ovipositor of the females, although several taxa have a reduced or absent ovipositor. There are more than 11,000 described species in Ensifera. Members of Ensifera are sometimes collectively known as "long-horned grasshoppers" although this designation often is limited to members of the family Tettigoniidae (the katydids, also called bush crickets in some countries) and not the crickets or weta. More commonly, the designation grasshopper itself refers to members of the orthopteran suborder Caelifera, also known as "short-horned grasshoppers." Ensiderans are particularly well known as singing insects, with the males calling mates via stridulation, either involving rubbing together portions of their forewings (katydids and crickets) or a femur-abdominal mechanism (some weta). The singing of katydids and crickets has been particularly appreciated in Japan and China, where people will visit favored locations just to hear their songs and where these orthopterans will be kept as pets. Even the poetry and arts of China and Japan have been influenced by the songs of katydids and crickets, and the appreciation and customs associated with the songs trace back hundreds of years, with popularity even in the Japanese court. As members of the insect order Orthoptera, ensiferans are characterized by chewing/biting mouthparts, incomplete metamorphosis (hemimetabolism), saltorial hind limbs (modified for leaping), and two pairs of wings that are held overlapping the abdomen at rest. The forewings are narrower than the hindwings and hardened at the base, while the hindwings are membranous and folded fan-like under the forewings when at rest. Orthoptera includes two suborders, Caelifera (short-horned grasshoppers and locusts) and Ensifera (crickets, katydids, and weta). The Ensifera, sometimes collectively known as "long-horned grasshoppers" (Naskrecki 2004), are typified by antennae longer than the body, while the Caelifera have antennae shorter than the body. Characteristics of Ensifera include fine and threadlike antennae with well over 30 segments (except the fossorial Cooloolidae); a sword-like, sickle-shaped, or needle-like six-valved ovipositor (when present); and elongate mandibles with a prominent incisor (Gwynne and Desutter 1996). While the ovipositor of ensiferans tends to be well-developed, female caeliferans usually lack a long, external ovipositor (Naskrecki 2004). Members of both orthopteran suborders tend to be large or medium-sized insects. The largest in body length are the katydids in the genera Phyllophora and Macrolyristes, which can exceed 3.9 inches (100 millimeters) in length, while the heaviest living insect is the New Zealand giant weta (Deinacrida heteracantha), with one recorded to have reached 0.16 pounds (71 grams) (Naskrecki 2004). In singing families in Ensifera, the males have stidulatory specializations of the tegmina (modified leathery front wings or forewings), including a toothed vein (file) and scaper, to make sounds. This is in contrast to the male caeliferans that sing in which the hind legs are utilized. In caeliferans, the auditory organs tend to be on the abdomen and they produce sounds by rubbing their legs against the abdomen, or they rub their hind femur against one of the veins in the tegmen (Naskrecki 2004). In ensiferans, the auditory organs (when present) are linked via modified tracheae to the enlarged mesothoracic spiracles (Gwynne and Desutter 1996). Essentially, sound is produced among the male katydids and crickets by rubbing one body part against another body part. On one tegmen (front wing) there is a modified vein, known as the stridulatory vein, that is equipped with a file-like row of teeth, from a few to hundreds of teeth. This modified vein is rubbed against a hardened edge of the second tegmen, known as the scraper. In most katydids, the stridulatory edge is at the base of the tegmina, while in crickets the entire surface of tegmina is modified for stridulation. (In short-winged katydids, the stridulatory area may cover the entire surface of tegmina.) Generally, in katydids, the stridulatory file is located on the left tegmum and the scraper on the right, while in crickets the stridulatory file is located on the right tegmum and the scaper on the left (Naskrecki 2004). Some katydids have other mechanisms for stridulation, such as using the mandibles or by rubbing hind coxae against modified thoracic sterna (Naskrecki 2004). Many crickets produce sound frequencies of only a few kHz, while some katydids may produce sound frequencies above 100 kHz. While cricket calls tend to have most energy within a narrow range of frequencies, katydid calls may vary from tonally pure sounds, often well above the human hearing range, to broad, noise-like calls (Nashrecki 2004). 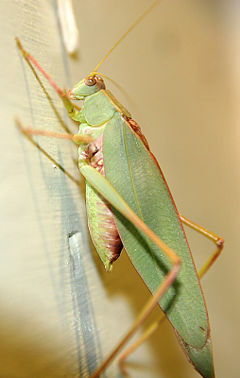 Ensiferans inhabit terrestrial habitats, such as meadows, savannas, and tropical forests, although many are found in marshes and other wetland environments, including various conehead katydids on reef beds. True mole crickets (Gryllotalpidae) are found in tunnels underground, where they feed on insect larvae and earthworms (Naskrecki 2004). Members of both Caelifera and Ensifera are primarily herbivorous, but range from herbivorous, to omnivorous, to exclusively predaceous species. Some ensiferans feed exclusively on pollen and nectar of flowers (among them, Zaprochilus spp.) and some specialize on seeds of grasses (for example, Neoconocephalus spp. and Ruspolia spp.) or pine trees and other conifers (for example, Barbitistes constrictus). Most katydids and crickets are opportunistic and feed on a variety of organic matter (flowers, seeds, fruits, caterpillars, snails, small lizards). Some mole crickets store germinating seeds for later consumptions. Predaceous katydids and raspy crickets may ambush insect prey or actively forage for them (Naskrecki 2004). Behaviorally, members of Ensifera tend to be largely nocturnal, versus the more diurnal Caelifera, which tend to feed and mate in the daytime and molt and egg lay at night (Naskrecki 2004). Most ensiferans are solitary, but many crickets are gregarious (especially members of the family Phalangopsidae), and cave and camel crickets also show gregarious tendencies. Some katydids also form large swarms, including the flightless North American Mormon cricket, Anabrus simplex, whose swarms can be devastating to crops, and conehead katydids, Ruspolia spp., which may form large swarms in Africa (Naskrecki 2004). Male ensiferans produce sounds to attract mates, as well as for defense of territory and to spread an alarm if seized by a predator. Females of some katydid species also can make short calls to signal a response to a male, although their means of sound production is different (Naskrecki 2004). Males may utilize two types of calls for courtship, a long-range call to advertise their presence and a softer, quieter, courtship song performed in the female's presence (Naskrecki 2004). The taxonomy of the suborder Ensifera is not settled, with a number of different taxonomic schemes proposed. Naskrecki (2004) recognizes 11,000 described species placed in approximately 1,900 genera, 21 families, and 6 superfamilies. The largest subfamily is Tettigonioidea, comprising the katydids (or bush-crickets), with over 7,000 known species and placed in 1,000 genera. Naskrecki (2004) also recognizes the superfamilies Grylloidea (crickets), with over 3,500 species and 500 genera, Stenopelmatoidea (Jerusalem and camel crickets), Gryullotalpoidea (mole crickets), the Mogoplistoidea (scale crickets), and the Hagloidea (grips or humb-winged crickets). This page was last modified on 22 August 2017, at 21:22.